November | 2014 | Living life in the carpool lane.. The harder it is to bend over, the more your first child will spill liquids and drop objects on the ground. I love being pregnant. I love feeling the baby move around. I love knowing that I’m not alone at the moment, that there is always someone with me, even when I’m up at night while all of you are asleep. I love trying to figure out what body part is poking out of my tummy. I love trying to figure out what kind of personality this little person in me is going to have based on her movements and how she interacts when I rub my belly. I love imagining what she’s going to look like when she comes out. I don’t like the constant aches and pains. I really don’t like the first trimester of constant nausea. I really don’t like the third trimester of constant discomfort. I don’t like that I waddle. I don’t like that I gain too much weight during each pregnancy. I don’t like that this pregnancy had way too many complications. I don’t like being confined to a wheelchair when we go places. I don’t like that I’m not allowed to do too much stuff. I don’t like the sore abdomen muscles. I don’t like the sore groin muscles. I don’t like it has to hurt to give birth. I don’t like the healing process after giving birth. I don’t like, even though labor is practically a routine thing, that there is always a chance of complication. I don’t like that I get so irritated so quickly when my hormones go all haywire. Hubby says that it seems that the dislikes outnumber the likes. While it may seem so, the truth of the matter is, I really do love being pregnant and all those dislikes are nothing comparent to the feeling of holding my sweet newborn when all is said and done. I’d like to take the opportunity to wish all my readers a very happy Thanksgiving. I’ll be taking today and tomorrow off the blog to spend with my family. I hope your holiday is filled with as much laughter and love as mine will be. I’ve been crafting. I’m sure you can tell. Quilts. Pinterest projects. Scrapbooks. Cards. Ricebags. I do have a craft blog, CutieQ Cards n Crafts. It’s a place where I concentrate soley on crafting, particular cards and scrapbooking. The goal of that blog is to feature cards that I put on Etsy and hope to sell. That blog has been stagnant since May 2014. It’s hard to keep up a craft blog. There is a lot of photography, watermarking, uploading.. technical stuff. It got hard to balance this blog with that blog, then all the pregnancy issues came about… so my entire life was put on hold. 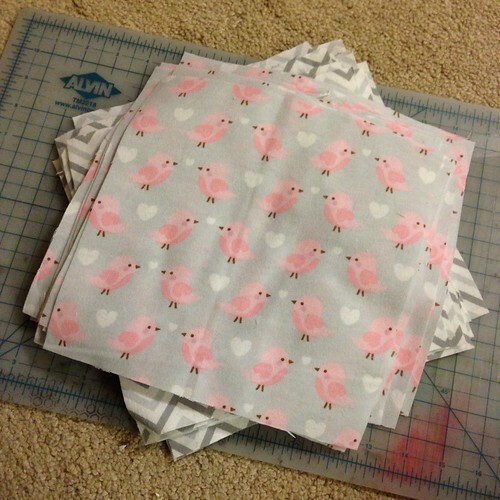 Now that things are relatively ok (modified bedrest allows me time to sit up and craft, type and actually do stuff), I’ve been thinking about that blog again. I still have dreams and goals of selling my handmade cards and other goods, but I have to be realistic and put that on hold for awhile. A new baby will make it hard to keep up with inventory and orders. I know starting up the crafting blog while pushing 8 months into a pregnancy is not the best idea. Things are going to get hectic again and I just might not be able to keep up with it all. But I want to do this. I need to do this. So, I’m going to do it. It’s going to be a once a week blog, updating every Monday. I’m going to try to keep up with holidays and seasons. I will try to make it a well-rounded blog about all the different methods of crafting that I am dabbling in. Eventually, I will start to feature items that I intend on selling and will reactivate the Etsy store with all the featured items. The blog relaunches on December 1st. In the meantime, check out what I’ve done in the past by clicking the link, CutieQ Cards n Crafts. When we found out we were pregnant, I contemplated whether or not we were going to have a baby shower. This is my second child. We have all the big ticket baby items, stroller, playpen, carseat, high chair.. etc. We didn’t NEED anything new. But then, we found out we were having a girl again, so I figured we didn’t need a shower at all anymore. I felt compelled to celebrate the pregnancy and this new little one. It’s not a shower. It’s a celebration. It’s a celebration that the pregnancy has lasted this long and that despite the hardships, the baby has been completed unaffected. By the grace of God, she’s been growing at a normal pace, and she moves around like she doesn’t have a care in the world. I didn’t register anywhere and am not obligating anyone to get me a gift or diapers or anything. I just want us to all get together to celebrate this pregnancy and all the hardships we’ve gone through during this journey. I cut the fabric earlier this week. It was my very first time cutting fabric and I have to tell you, Youtube makes it look easy. It may have been my supplies. 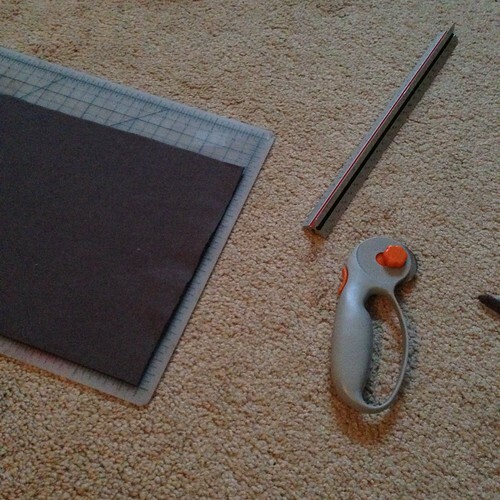 I’m using a fairly small cutting mat. It’s the one that I use for my papercrafting. I’m not using one of those flat rulers that you can find in the fabric section of a craft store. That ruler used to be my brother’s, who used it during his college art days. 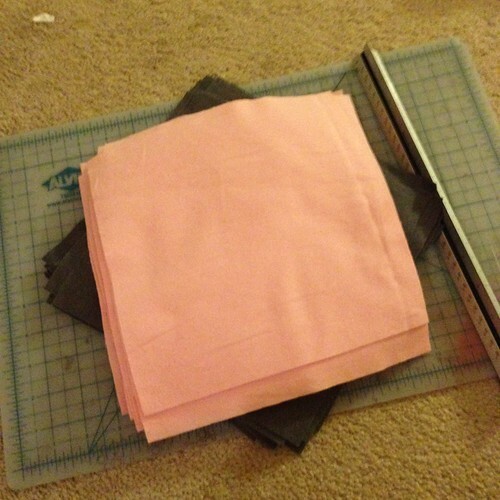 The only thing “fabric crafting” that I purchased for this project was that rotary cutter. My cuts weren’t perfect like they looked on YouTube, but once I realized that I would eventually be “ragging” the edges, I was ok with a little imperfection. It took about two different days to get all the fabric cut into 9 inch squares. I made 14 squares of these two colors. Sorry the color is off. It was evening when I cut them and I had to depend on the lamp in our house. I made 16 squares of each of these patterns. The next item I have to cut is batting. Then, I start to sew! I think it started around Easter of this year. She was given a Reese’s Peanut Butter Egg from Gymboree during their Easter Egg Hunt. We were in the car when she broke the wrapper open and, before I knew it, she ate almost the whole thing. Almost immediately, she stuck her fingers in her mouth and whined a little like something was bothering her. Thinking it was just the grittiness of the peanut butter, I gave her water and some milk. She stopped complaining. We had family over for a visit to our apartment. M ate some dinner, but she just wasn’t her peppy self. She was a little uneasy and a little clingy. I thought it was because she didn’t normally see these family members. Then, while she was sitting on my lap, she just vomitted. Projectile vomit. Everything in her stomach just out on the floor and the recliner. Immediately after that, she was fine. I started to suspect a peanut allergy, so I made it a point to make sure she avoided peanuts in her foods. Fast forward to September. Hubby purchased peanut butter m&ms, but kept them upstairs in his office. M went upstairs before bed and went into Hubby’s office. Because they were m&ms, she thought they were ok and ate one. Almost immediately after eating it, she stuck her fingers in her mouth and whined like something was bothering her inside her mouth, similar to what she did at Easter. I gave her lots of water and we prepared ourselves for her to throw up again. She was fine for about half an hour, when she started to act a little different again. We were prepared for the vomit, but it didn’t come. Because she was acting a bit off, I gave her a dose of Benadryl. Before the Benadryl kicked in, I noticed her smacking her lips and mouth together. I asked her if anything felt itchy and she said her mouth was itchy. We stayed up until the Benadryl kicked in and she no longer smacked her lips together and was no longer complaining about anything feeling itchy. A few weeks later, I talked to her pediatrician about it. They scheduled a skin test and a consultation with the allergy doctor. At the skin test, the peanut allergy did NOT show up. However, the allergy doctor said that because of her reaction during the two times she ingested peanut butter, he wanted to do a blood test to confirm. Blood test confirmed that she DOES have a peanut allergy. Category III, he called it. I think it had to do with the level of IgM detected. It’s pretty much the middle of the peanut allergy spectrum, which also meant that she has a very little chance of outgrowing it in the future. We were issued epipens. I take the epipen and a bottle of Benadryl wherever we go now. In a future blog post, I’ll talk about how our lives have slightly adjusted since her diagnosis..